San Rafael, Calif.—Following what they are calling a “phenomenal growing season,” most wine grape growers in the Santa Cruz Mountains AVA just south of San Francisco are “totally jazzed about this year’s vintage,” according to Mary Lindsay, co-owner of 300-case Muns Vineyard in Los Gatos, Calif., and president of the Viticulture Association of the Santa Cruz Mountains (VASCM). The sentiment echoed throughout the region. Muns Vineyard co-owner Ed Muns called it the best growing season in the vineyard’s 11 harvests on the Loma Prieta ridge top. Muns credited a long growing season with even conditions that allowed unimpeded fruit development. “For Pinot Noir especially, the weather was ideal, with consistent mild temperatures and no rain between bud break to harvest,” Muns said. With no unexpected heat spikes or low temperatures, vines developed to maximum potential. The season started early, and vines charged through to harvest without stopping. Nathan Kandler, winemaker at 15,000-case Thomas Fogarty Winery in Woodside, Calif., likened the growing season to an 800-meter race, calling it “a near full sprint for much longer than you like." Vineyards around the region reported early bud break; dry, consistent weather conditions promoted early flowering, fruit-set and ripening, and harvest came early, “one of the earliest in history” at Fogarty, Kandler said. “We picked nearly all of the 70 tons of Santa Cruz Mountains Pinot Noir we processed during the two weeks between Aug. 24 and Sept. 7. Chardonnay was done Sept.19, nearly two months earlier than 2010,” Kandler said. As always, defining a “normal” season is virtually impossible, and it varies among microclimates in the 322,000-acre AVA. Closer to the coast in Bonny Doon, Ryan Beauregard, owner of 5,000-case Beauregard Vineyards considers 2013 the best year of the past several, but called prior years abnormal. “If anything, this year was more of a normal growing season. The past few years had been the abnormal years: 2009 and 2011 were unusually cold; 2012 was better, and 2013 was the best of the past five growing seasons,” he said. Beauregard’s harvest began three weeks earlier than usual, he reported. “We started harvest Aug. 28 and will finish in October. In years past we have harvested grapes well into November,” he said. 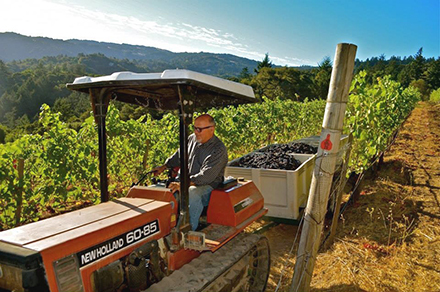 Harvest dates were early in most vineyards, Lindsay said, with isolated harvests in the Santa Cruz Mountains in mid-August, largely due to site-specific conditions such as shallow soils and/or dry farming. The AVA’s harvest started in earnest around Labor Day, bringing early harvest to most vineyards. With little dehydration, cluster weights are up. “Some growers found themselves with more fruit than they realized, meaning extra fruit has been available. With the increased vineyard yields, winery production is up as well. “Wineries that want to are operating at capacity, and many are making available excess fruit from their own estate vineyards,” according to Lindsay. Michael Wargin, who owns 522-case Wargin Wines in Watsonville, sources fruit from a few vineyards in Corralitos. Some small vineyards planted a few years ago are starting to come online, and those growers are seeking homes for the fruit. Wargin's own wine production is up at least 20% this year. Lindsay reported that more wineries from out of the region are sourcing Santa Cruz Mountains wine grapes, made more feasible by the increased availability. The viticulture association runs an exchange on its website listing fruit availability at vascm.org. Representing the winegrowers in the appellation, VASCM is not the only agency serving the region. The Santa Cruz Mountain Winery Association (SCMWA) represents the wineries that also have estate vineyards and may source fruit from other vineyards, both within and outside the AVA. According to the Grape Crush Report 1,309 tons of Pinot Noir from District 6 (Alameda, Contra Costa, Santa Clara, San Francisco, San Mateo and Santa Cruz counties), were crushed in 2012. The average price per ton in the district was $1,812 (compared to $1557 statewide). Foxx works with vineyards throughout the AVA and said that 80% are “coming in heavy. Most Pinot Noir vineyards, especially in the Corralitos area, are at a minimum of 25% over yield of last year—and 2012 was a big year. A select few vineyards are showing even more production—some as much as 50% or more over normal. “Quality is very high. There have been some issues with even ripening in younger vineyards, and wine quality may have been affected if allowed to overproduce. Older vineyards are showing the best fruit I have seen in years, even with a big set. “I attribute this to the perfect spring weather and excellent set. Disease pressure was very low during summer months. There were no heat spikes after veraison. We have enjoyed a slow, steady maturation period that has produced perfect numbers: pH is coming in 3.2 to 3.5, depending on harvest date. Sugars are 23° to 25° (Brix); less for those choosing to pick at the first hint of ripeness. TA is hitting 7 to 8,” Foxx said. “This is what I call a winemaker's year. With environmental pressure low—no significant rain or heat—winemakers can pick their harvest date based on individual vision and style preference,” she said. “Each vineyard I work with is in full expression of its terroir, showing fruit flavors unique and fully developed across the board. In general cluster size and density is up; phenolics are strong; color is good, even at first crush. Pinot Noir clusters that normally average 2 ounces are showing easily 3 ounces per cluster. Bins are regularly topping out at a pure half-ton,” Foxx said.